Somebody once said, even if you got a million, you don't got it to spare, know whatuhmean? Robby didn't have $12M to spare, that's for sure, but he's handling the situation with great class and dignity. I'm a guy who thinks that society judges steroids much too harshly. From a legal standpoint, I don't mind their enforcing their rule. From a moral standpoint, this isn't a violation that makes my top ten, as to complaints about pro athletes. Taking a wild guess that he's got a bone bruise and that the foot is badly swollen, nice shades of purple and yellow etc. As you know, every team wrestles with the decision as to when to push its superstar back on the field -- or to tackle him down with four men to keep him off it. It goes back to the days of Mickey Mantle getting his legs taped from hip to ankle so he could limp out to CF every game and the Yankees would laugh about it, imitating the manager. "How's the knee, Mick?" Oh, I was able to scotch-tape it back together. "Good, good. We need you out there." He's a DH. For all we know, he goes deep twice on Sunday. It's painful to watch him swing, though, ain't it? Technically isn't hitting much while he "learns" second. Dr. DL thoroughly enjoyed the TV report: "When do you think you'll be ready, Dee?" they ax him first day. "I'm ready now." LOL. 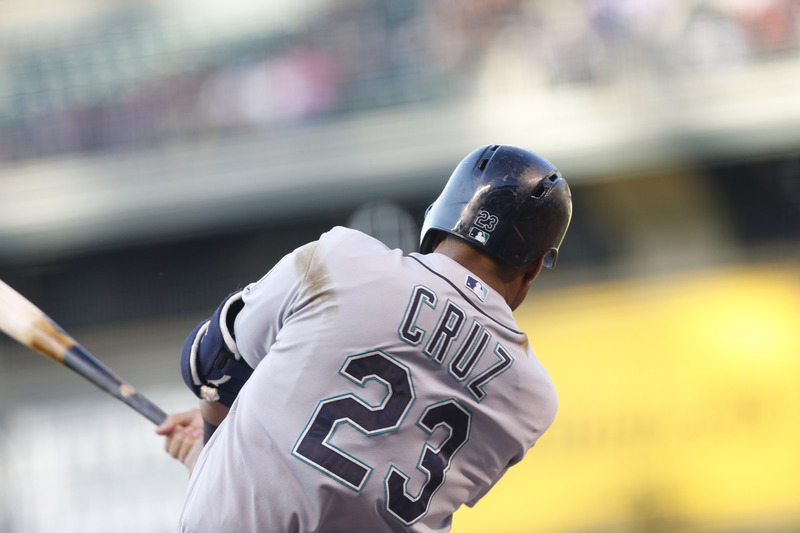 Did you see his fist swing when the M's tied it up Friday? Coming back from 0-4 to 4-4? He looked like the 7th game of the World Series, no joke. You love this guy yet? Blowers described it well - it's got to be scary, "game speed" after a winter off. Wouldn't you know his first play was a tough DP, Seager goes into foul territory, flips it long, and Gordon has to turn it real quick. First play of the spring!, and it's in a triple-deck stadium. He made the play, though. He's a fizzler is 'cause he's hitting .172 the last week. But man. What a player. I'll take about a million of 'im. Again, just a PSA that his .800 slugging feast has been devoured and he's back to hitting .214 the last week. You're a Denizen; you realize that every player alive has weeks of .214. Just FYI - he was "Mitch Hot" for a while there but he ain't any more. Matty predicting he'd be fighting the oblique for a while. He is. Although Saturday night, he whistled a sweeeeet line-drive single into the RIGHT-center gap and had another hit to go with it, 2-for-4. Excellent catcher with light-tower power, pitching in where he can at the moment. We'll all be thrilled when he's fully back. Again today the M's reiterate that if/when they could get Iwakuma back, that's the #2 starter that we fans are banging our spoons on the table for. Didn't say I thought the plan was sound. Just taking note of the hope they're selling their fans. I'm late to the party here, but from watching him play Saturday I don't think it's just the foot - it's from being hit in the elbow as well. Yes, it was on the elbow pad, but if you looked at him in later at bats, he was shaking his left arm and hand, like you do when you get hit on the funny bone and your fingers are tingling or numb. He had a couple of swings and misses and you could see him grimace from the pain. Not in the lineup Sunday so with Monday as travel, he gets two days off. We'll see what Tuesday's lineup looks like.